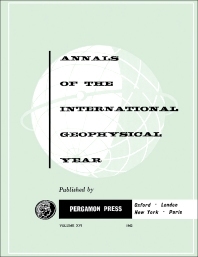 Annals of the International Geophysical Year, Volume 26: IGY Calendar Record: Ozone Instruction Manual presents various indices and highlights of the solar, geophysical and associated events which took place during the IGY, a period of intensified observation of the earth and its environment. This book is organized into two main parts encompassing six chapters. The first part describes the features of the charts and tables in this Calendar Record of the IGY. The Supplementary Tables are additional indices of world-wide auroral observations which could not conveniently be adapted to the Calendar Record itself. They also summarize for historical purposes the end product of the IGY World Days Program, namely the Calendar of Regular World Days and Intervals decided on before the IGY began and the declarations of Solar Alerts and Special World Intervals. The second part considers the determination of some constants used in the calculation of the amount of ozone from spectrophotometer measurements and an analysis of the accuracy of the results. This book is of value to geophysicists and researchers.